to conserve heat and their long guard hair protects them from weather, cold, and mosquitoes. 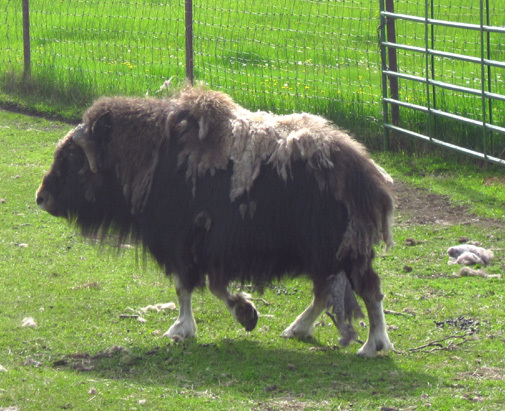 musk ox grow a thick layer of qiviut (pronounced KI-VEE-UTE) over their entire body. This fine underwool is shed naturally each spring when it is no longer needed." The Native Alaskan women who belong to this cooperative purchase qiviut fiber from the musk ox farm and knit it into fabulous scarves, hats, caps, and headbands for men and women, babies' caps, and women's tunics. Because the fiber is so rare, warm, and sensuous and the knitted items are so intricate, these accessories currently range in price from $85.00 to $625.00. 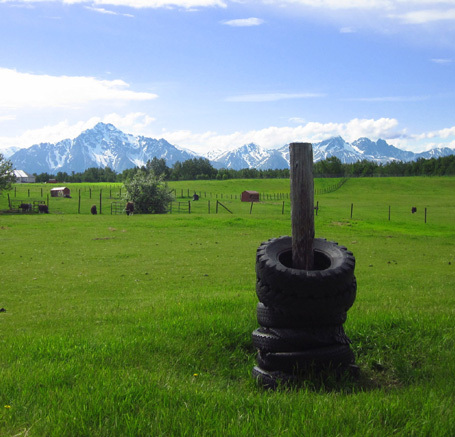 Before we began our Alaskan adventure I read in several RVers' blogs and The Milepost about this cooperative farm near Palmer that domesticates the prehistoric musk ox. It intrigued me enough to put it on my Definite List of Things To Visit when we were near Anchorage. Bottom line: it's a great experience and well worth the cost to tour the farm. Whether you can afford to buy any of the items made from the qiviut is quite another matter. to the north and the Chugach Range to the south. 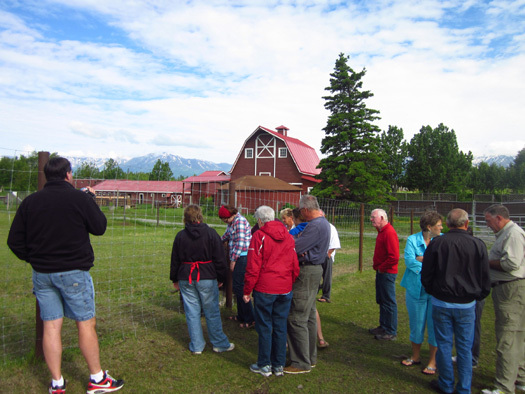 The information in this entry comes from a variety of sources including the Oomingmak Cooperative's brochure, their website, the Musk Ox Farm website, The Milepost, our personable guide during today's farm tour, displays in the museum barn at the farm, and our own observations while there. 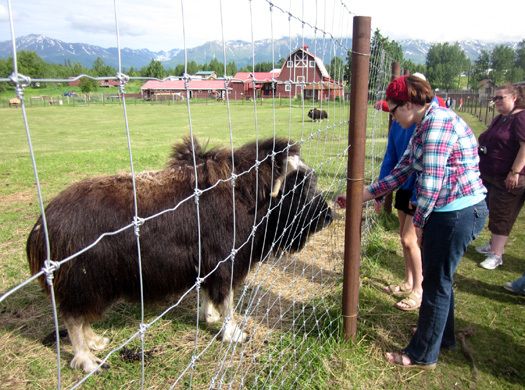 The Musk Ox Farm is located on one of several original Depression-era farms established in the Matanuska Valley, including the town of Palmer, in the mid-1930s. It wasn't a musk ox farm originally, however. Musk ox are described as Ice Age survivors. The ones native to Alaska were driven to extinction in the mid-1800s, more by climate changes than hunting. Part of Canada�s wild herd was reintroduced to Alaska in the 1930s. 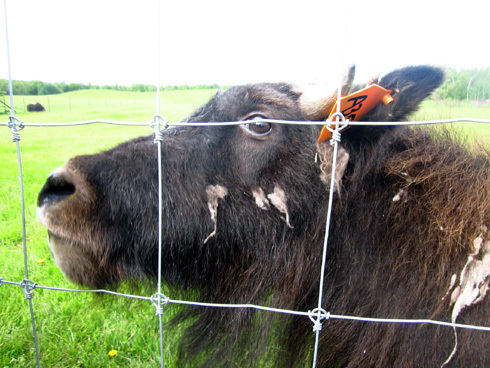 More than 3,000 musk ox now roam free in northern Alaska. It is estimated that about 150,000 musk ox continue to thrive in arctic regions around the world, including Canada, Greenland, Scandinavia, and Siberia. From 1954 to 1964 a man named John Teal learned to successfully domesticate and breed musk ox on his farm in Vermont. In 1965 he established the first large-scale musk ox farm at the University of Alaska in Fairbanks with 32 calves captured on Nunivak Island. Within ten years the herd reached 100 adult musk ox and calves. 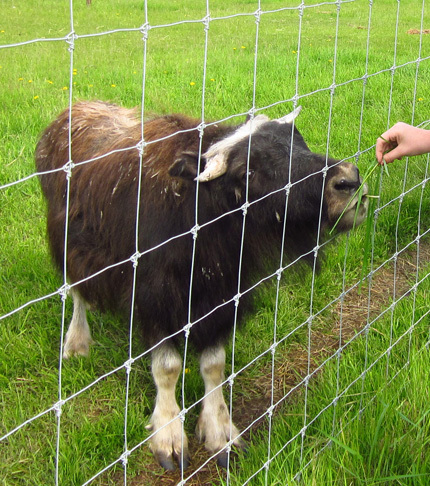 A small, friendly female musk ox takes some grass from the hand of a visitor. 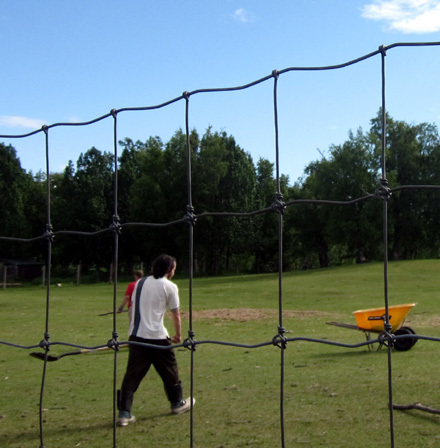 Teal's goal was to locate domesticated herds in remote Alaskan villages, closer to their natural habitat and accessible to Native Alaskans for economic reasons. The herd was moved to Unalakleet, Native land in western Alaska that is well off the road system. The musk ox did fine but there were too many logistical problems for that site to be practical. After Teal's death in 1982 the Musk Ox Producers' Cooperative was created to assume responsibility for the health and welfare of the herd. 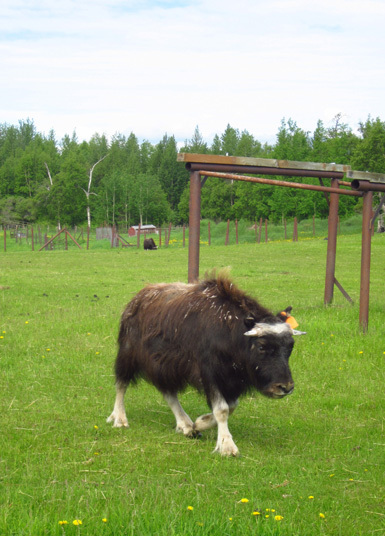 Since the original farm was no longer available in Fairbanks, the musk ox were moved to their current location in the Matanuska Valley. Above and below: this area is a nice place for people, too! 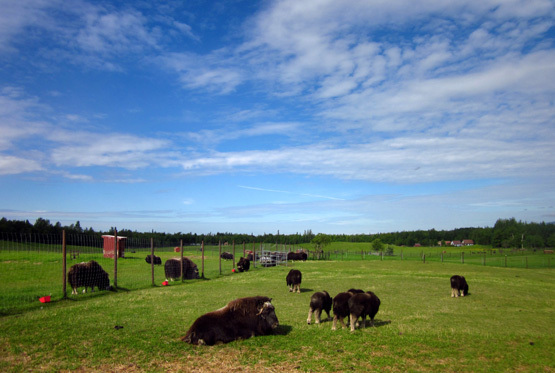 This location has proven quite successful -- an ideal climate for the musk ox, plentiful food, veterinary services available, and in prime tourist territory. Fees collected from tours have reduced the reliance on grants to keep this non-profit group going. 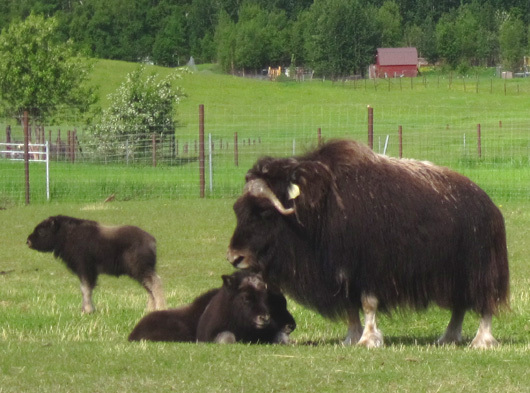 So other than the noble idea of keeping this species alive, why would anyone want to raise musk ox? Their meat doesn�t taste good and they don�t produce milk that humans like, either.
. . . and they keep the poop-scoopers busy, too! One of Teal's greatest contributions was realizing that their primary economic value is in the very soft underwool (qiviut) they shed every summer -- and making this fiber available in large enough quantities to be profitable for Native Alaskan women and elders in remote villages so they can be more self-sufficient. 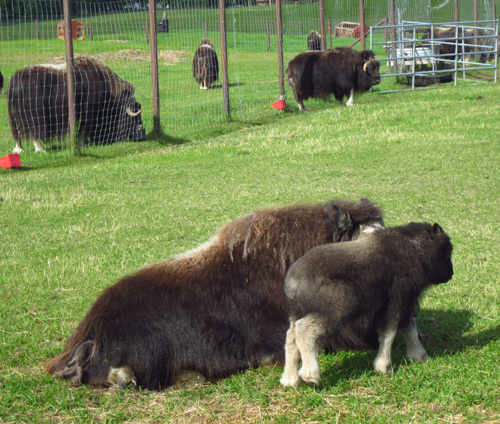 The University of Alaska in Fairbanks raises musk ox now at its Large Animal Research Center. 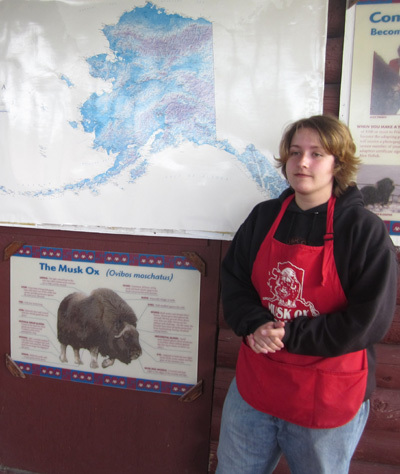 That and the Palmer Musk Ox Farm are the only two locations I'm aware of in Alaska where visitors can see domesticated musk ox. 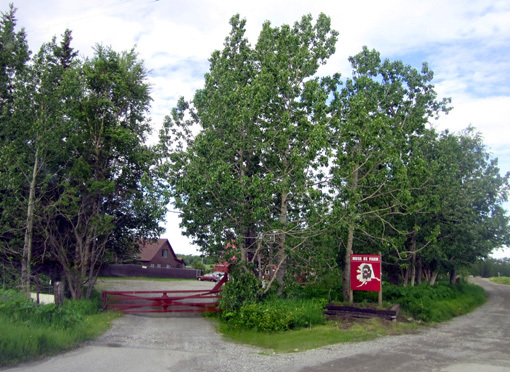 What is now Palmer was originally home to Athabascan Indians before a trading post was established in 1890 by George Palmer. A railway station was built there in 1916 and it developed into a town. In 1935 it became the site of one of the most unusual experiments in American social engineering, the Matanuska Valley Colony. 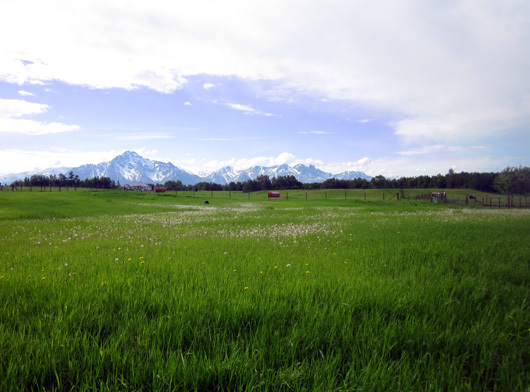 The Matanuska Valley is the richest agricultural area in Alaska. It has a relatively long growing season (for Alaska! 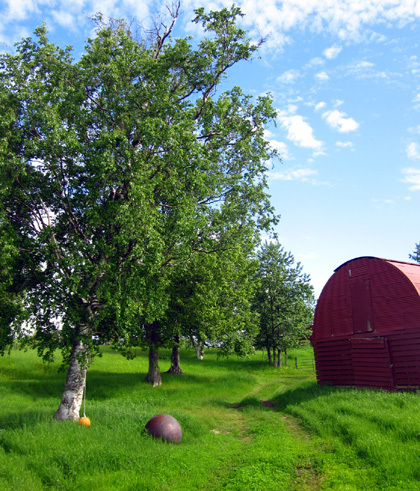 ), rich soil, and a unique microclimate that, along with the long hours of daylight in the summer, allows farmers to produce giant vegetables. 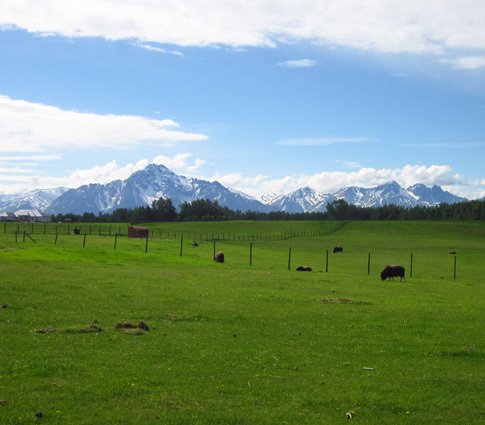 One of President Roosevelt's New Deal relief agencies chose 200+ hardy farm families, primarily of Scandinavian descent from northern Michigan, Wisconsin, and Wisconsin, to join an agricultural colony in the Matanuska Valley. The failure rate was high but many of their descendents still live in the area. 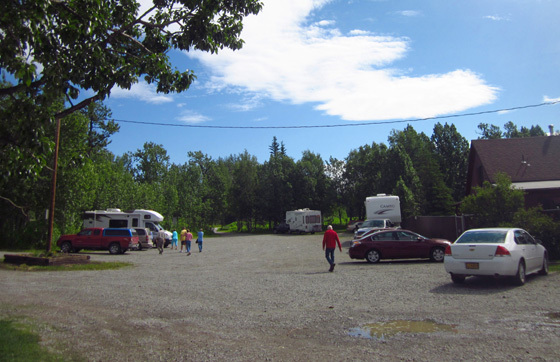 Palmer is the only community in Alaska that developed primarily from an agricultural economy. It continues to be the most productive farming area in the state. 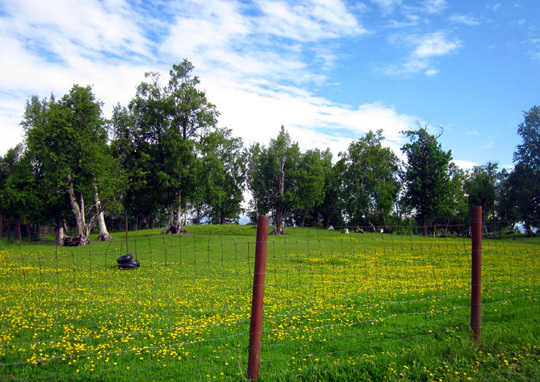 The farm is located on Archie Road a short distance off the Glenn Hwy. at MM 50.1. From May to September it is open to visitors from 10 AM to 5 PM and by appointment during the winter. Tours begin every half hour in the summer. I called to make a tour appointment yesterday and to determine if there was room to park the Cameo on-site. The young woman who answered the phone assured me there was plenty of room for RVs, which frequently visit the farm. We were able to reserve two spots on the first tour at 10 AM. Since we were parked overnight at a turnout just twelve miles to the east we had a leisurely breakfast this morning before packing up the camper to go to the farm. We still had some concerns about the parking lot and wanted to be the first ones there so we would have adequate maneuvering room. We arrived at the farm at 9:30 AM and had to wait on the little rural road for 15 minutes to get in the gate (next photo), then another 15 minutes to get in the door. While we waited another 5th-wheel came in and parked behind us. Lo and behold, it was a 2003 Cameo with a nice couple from VT. We�ve seen so few Carriage 5th-wheels up here so far this summer that it was a nice surprise. The Cameo couple was on a 34-day caravan with 16 RVs, the lead vehicle, and a mechanic in another RV at the back. They enjoyed the tour with the caravan and now they are on their own to explore some more. 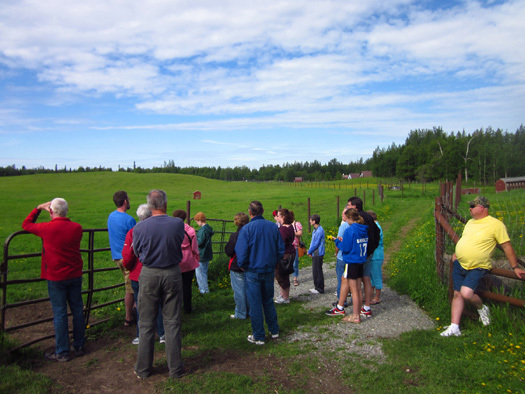 Our musk ox farm tour began at 10:15 and lasted for an hour. That was my only complaint about the tour. The guide had to repeat basic instructions (do's and don't's) several times as new people were allowed to join our group after we'd gotten out to the fields. The late-comers also asked questions about information she'd already told us at the beginning of the tour. It would have been more pleasant for everyone if the late folks had been held back until the next tour group started. 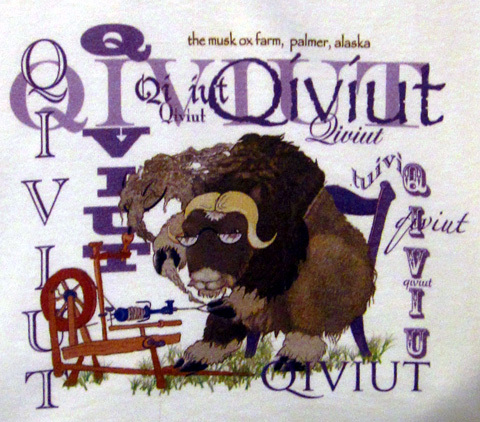 The farm raises the musk ox and gives the qivuit to Native Alaskan (mostly Yupik) women in remote villages in the western part of Alaska to knit into scarves, hats, and other accessories. They can knit as much or as little as they want and can choose the types of garments they want to make. 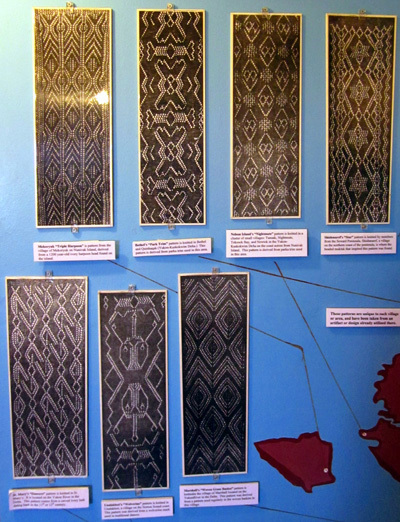 The knitters from each village have their own distinct pattern for the scarves they make (next photo). Click here to see the intricate designs more clearly and to read about their origin. Belonging to this cooperative is a good way for the women to supplement their family's traditional subsistence lifestyles since it is so hard to make a living in extremely isolated Alaskan communities accessible only by air. It's difficult to start new businesses in the Bush and job opportunities are extremely limited. Many young Native Alaskans have to leave their villages and live in more populated areas of the state to make a living. 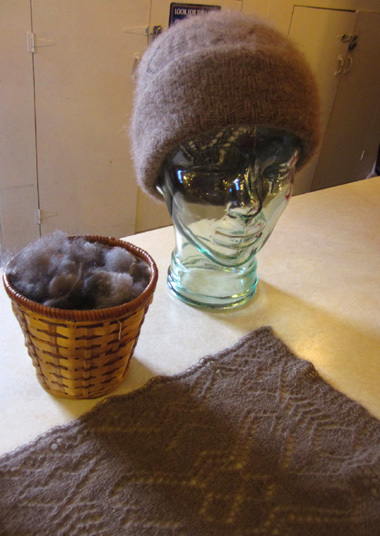 It takes about a pound of underwool to make one hat; each grown musk ox sheds about five pounds of the stuff each summer. Some we saw were already shedding and looked pretty ragged, like the one below. There were a lot of clumps of qiviut lying not only in the fields but also in the pathways where we walked. salvage the fiber. Maybe it's not good quality? You can see clumps of qiviut on the ground, too. The women in the Oomingmak Cooperative get to keep 90% of the sales price of the expensive garments they knit; the farm gets the remainder to maintain the animals. Additional farm income is derived from the cost of the tours. The farm is a non-profit cooperative and a worthy endeavor so we didn't mind paying the highest ticket price of $11 each. The senior rate of $9 is for age 65 and over (we aren't quite there yet). 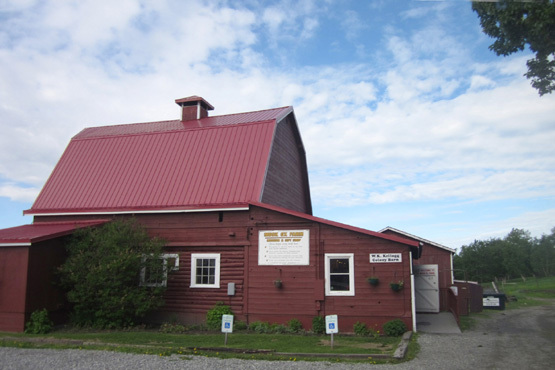 The farm has exhibits about the musk ox project and several garments to see but none of them are for sale. 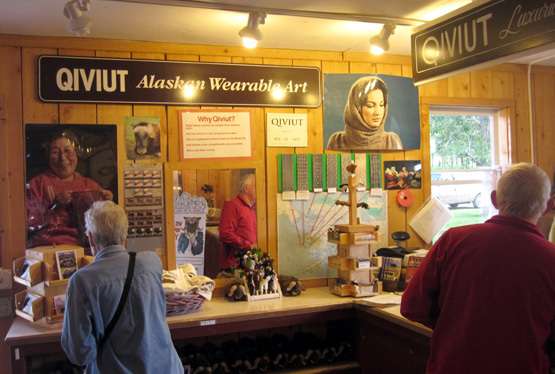 Qivuit accessories can be purchased at the Oomingmak's store in Anchorage or online. I love this logo on some of the t-shirts and note cards. Our tour guide says there are currently 73 musk ox at the farm. 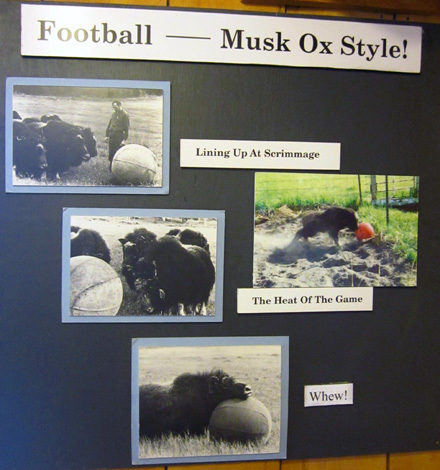 All of the musk ox -- which don't have musk glands, aren't oxen, and are more like goats and sheep -- have names. Musk ox have very distinct personalities with as much variation as you'd find in humans. The cows aren�t bred until they are at least four years old, and only certain cows and bulls are used for breeding. They want gentle, domesticated musk ox, not ones with undesirable traits. I think I'll mosey over here and meet these nice people . . .
Musk ox are not as big as you'd think they'd be. Mature bulls stand just four to five feet tall at the shoulder and weigh between 600-1,000 pounds. Cows are smaller, ranging from 400-600 pounds. The mothers and babies are kept in two separate fenced fields. Yearlings, two- and three-year-old females, and bulls are kept in three other fields. We were led to all the fields so we could see, touch, and feed the musk ox. 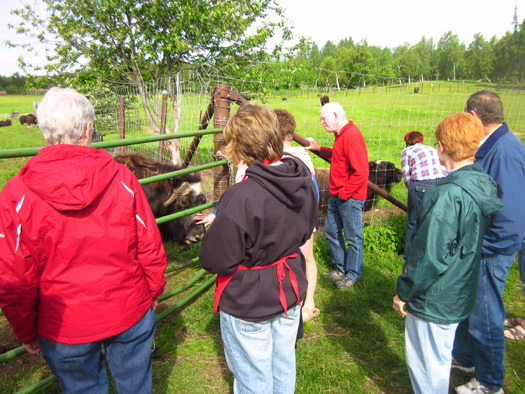 The guide had some funny stories to tell us about the musk ox�s habits and behaviors. We really enjoyed this tour. The weather was great, the farm and surrounding snow-clad mountains were gorgeous, the animals intriguing, and the guide very good. She told us much more that I can�t remember and she answered everyone�s questions very thoroughly. We highly recommend this tour for kids from 2 to 92 years old. It was well worth the money (that�s coming from frugal folks! ).